Oh Boy: Has Papadopoulous Been Recording Conversations With Former Trump Colleagues for Mueller? A very spooky Halloween thought for Team Trump, and it's not totally groundless speculation either. In our analysis of yesterday's developments, we noted that former Trump aide George Papadopolous -- who was admittedly very low-level and is described by the White House as a campaign volunteer -- has become a cooperating witness for Robert Mueller. We also noted the unusual timing of Mueller choosing to release Papadopolous' guilty plea on the same day charges were announced against Paul Manafort and Rick Gates. One of the possible reasons he may have synchronized those revelations was to explicitly telegraph that even though the Manafort and Gates indictments were drawn from pre-Trump-era crimes, the special counsel probe still has its eye on the ball. I wrote that the big question is whether any of the three aforementioned men have anything of value to offer Mueller, in terms of implicating bigger fish in a potential collusion plot. Papadopoulos may have been secretly working for the feds for the past three months, since his arrest, to gather evidence on suspects in related Russiagate matters in hopes of leniency. He was a perfect guy to try to recruit for that — young, in over his head, outside the Trump inner circle and therefore owing little loyalty to the administration. Mueller may have scared him senseless with threats of a long prison sentence for lying to the FBI and the promise of much reduced charges if he played ball...Imagine Papadopoulos phoning a former top Team Trump official in early August to say, “They’ve arrested me! I don’t know what to do! I think I should tell them everything and make a deal!” He might have been told no, no, no, stay calm, deny X, Y, and Z, we’ll make sure Mueller never finds our emails from the campaign. And meanwhile, unbeknownst to the target, Mueller’s recording the entire conversation on Papadopoulos’s end. If Papadopolous is really the irrelevant, marginal figure Trumpworld is making him out to be (and much of his own conduct suggests), it seems unlikely that he could dial up key players and bait them into making incriminating statements. But maybe Mueller isn't fishing for big tunas in this stage of the investigation; maybe he's been trying to get a sense of who was willing to speak freely with a guy like Papadopolous, thus expanding the list of people he might squeeze for information as he trolls for bigger targets. It's also possible that this is all a dead-end, which would follow if there's no meat to hang on the bones of any "collusion"theory. Meanwhile, what to make of this? Do not be fooled by the “Conspiracy against the United States” heading on Count One (page 23 of the indictment). This case has nothing to do with what Democrats and the media call “the attack on our democracy” (i.e., the Kremlin’s meddling in the 2016 election, supposedly in “collusion” with the Trump campaign). Essentially, Manafort and his associate, Richard W. Gates, are charged with (a) conspiring to conceal from the U.S. government about $75 million they made as unregistered foreign agents for Ukraine, years before the 2016 election (mainly, from 2006 through 2014), and (b) a money-laundering conspiracy...On first glance, Mueller’s case, at least in part, seems shaky and overcharged...From President Trump’s perspective, the indictment is a boon from which he can claim that the special counsel has no actionable collusion case. It appears to reaffirm former FBI director James Comey’s multiple assurances that Trump is not a suspect. And, to the extent it looks like an attempt to play prosecutorial hardball with Manafort, the president can continue to portray himself as the victim of a witch hunt. Except...isn't climbing the food chain and pressuring potential witnesses to give up the goods a very common prosecutorial tactic? Trump may claim "witch hunt" victimhood regardless, but I'm not sure yesterday's events buttress that case. His former campaign chairman has been charged with illegally laundering money earned from advising a Kremlin stooge in Kiev, another former campaign adviser pleaded guilty to lying to investigators about contacts with Russians about gathering dirt on Hillary Clinton, and John Podesta's brother resigned amid reports that Mueller's investigative sights are trained on his Democratic firm. Trump himself probably isn't a suspect, but that doesn't mean a serious case isn't being advanced, ensnaring members of his orbit and some Democrats alike. 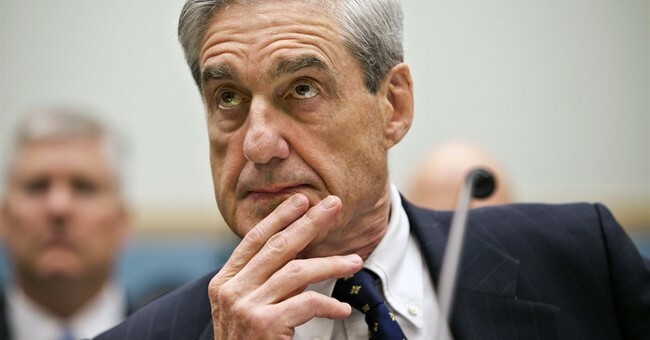 If there was "NO COLLUSION," and all Mueller produces in the end are tangential charges, feel free to blast the investigation as a waste of time (shouldn't the final review contain important information about Russia's meddling efforts, which may not implicate any American political party or campaign at all?) -- but right now, Mueller's probe must be allowed to play out.